Built in 2013 this city centre apartment is a wonderful combination of the bright, modern and spacious set in the heart of one of the UK's loveliest medieval cities. Well appointed, tastefully decorated and beautifully furnished, this gem of an apartment comes with its own dedicated off-street parking place right outside the front door. Each of the two bedrooms has a comfortable double bed, chest of drawers, bedside cabinets and TV – the master bedroom has its own en suite bathroom with toilet, basin and power-shower. The second bedroom has a large fitted and fully mirrored wardrobe with all the hanging space you could possible want for your holiday. There is a spacious family bathroom with toilet, basin and bath with a shower attachment (please see photos) – both bathrooms also have large heated towel rails. The lounge is spacious and airy with floor length windows, has very comfortable sofa and armchair seating for 4 people and a large dining table with seating for 6. A 40" HDTV is connected to both Sky and Blu-Ray player, which will also play music CDs. The kitchen, which leads off the lounge, is well equipped with modern appliances comprising a fan oven, 4 ring ceramic hob, extractor hood, microwave, toaster and – for the coffee lovers like us – a Nespresso coffee machine, complete with a supply of pods. To complete the equipment, there is a clothes washer-dryer and a full size fridge-freezer that sits alongside a floor length window, flooding the kitchen with light. Broadband (BT Infinity) wifi is included in the rental, as are landline telephone calls to 65 countries and mobile calls to 8 (including USA, Canada, China, Hong Kong & Singapore) - so guests can easily share their holiday experiences with friends and family back home! The apartment's location and its huge advantage of an allocated parking place for your car makes exploring the beautiful West Country so easy: Stonehenge is less than 9 miles away, the New Forest only 10 miles and coastal port towns of Bournemouth, Southampton and Portsmouth are all within easy reach by car or by train. The apartment is located just 250m from Salisbury station, from where trains run every half hour to London, which is just 90 minutes away. You might have guessed that we love this apartment and the city – we enjoyed hunting for just the right apartment for both city-based and local area explorer holidays and we hope you'll agree that we found it! Siubhan & Mark own and manage two properties, one here in beautiful Salisbury and another in Central London. Siubhan was born and brought up in Wiltshire and is particularly happy to be reconnected with this beautiful area after a few years away. The apartment's location is ideal for visitors who want all the amenities of a city centre as well as quick and easy access to the wonderful surrounding countryside. And the dedicated off-road parking space is an absolute boon for our guests who have their own car. The apartment is modern, bright and airy and provides a perfect base for a city-break or a touring holiday. We adore it's closeness to the city centre, Cathedral, riverside walks and pretty parks that are all within very easy walking distance - and the stroll along Fisherton Street with its idiosyncratic mix of shops is always entertaining. The apartment features 2 bathrooms - an ensuite bathroom with shower in the master bedroom and a spacious family bathroom with toilet, basin and bath with a shower attachment. Both bathrooms have large heated towel rails. Central location. Modern, clean and well appointed. Central location - close to train station and centre of town. Modern, clean and well appointed - a vegetable peeler would be the only extra addition to the kitchen recommended. Appreciated the drinks in the fridge on arrival. The house was clean and comfortable and in the heart of town - walking distance to cathedral and great shopping. Our overall impression was very positive. The two bedroom apartment was quite comfortable, and it’s location in downtown Salisbury made the central area easily accessible to walkers. We did not rent a car but were able to walk or bus everywhere we wanted to visit, like Stonehenge and Avebury and Bath. Mr. and Mrs. Litherland, the homeowners, were very helpful and prompt in following up to be sure we had everything we needed. The apartment was very comfortable and well appointed. We left the car parked for most of our stay and visited the city on foot. We enjoyed our stay . 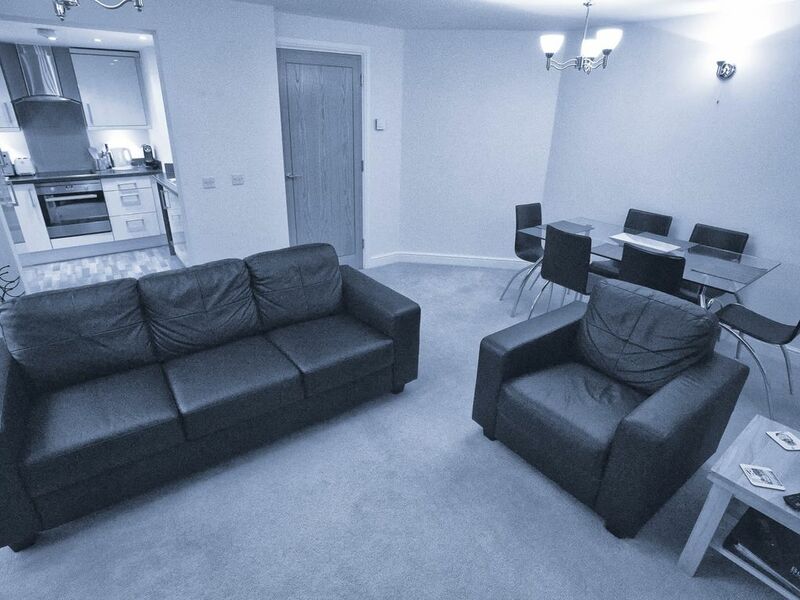 Very clean flat and near city centre to enjoy food and drinks without driving. Enjoyed the flat and car park . I will come again if I am visiting the area . Wiltshire is one of the UK's loveliest counties with its green, rolling chalk hills of the Marlborough Downs and Salisbury Plain and an abundance of picture postcard villages nestled into the countryside. And it seems that each and every village has a traditional pub serving great local beers and delicious home-cooked food. The county's towns are a fascinating blend of ancient and modern where beautiful old English architecture, built on the back of the wealth generated by the wool trade, exists side by side with bustling and modern town centres. The county appears to have more than its fair share of historic houses and estates, including Wilton, Stourhead and Longleat, as well as some of the world's most impressive Palaeolithic and Neolithic sites: Stonehenge, Avebury, West Kennet Long Barrow, Silbury Hill and Uffington White Horse to name just a few! Travel just a few miles south of Salisbury and you can be at the seaside, to the West a few miles and you are in the centre of the wonderful New Forest, where you can walk, horse-ride or just enjoy the mix of woodland and heath. The whole area begs to be explored and enjoyed! And as for the city of Salisbury itself, it was rightly rated number 7 in the Lonely Planet “top 10 world cities” list for 2015. Salisbury is charming, compact and ancient with beautiful mediaeval buildings lining the streets, a large open market square lined with shops, cafes and restaurants and the River Avon running through the centre of the city. Salisbury Cathedral is a fully evolved masterpiece: from its origins in the early 1200s, via the addition of the tallest spire in Britain a century later, through developments in the subsequent centuries, it has grown and increased in beauty and is the worthy home of the priceless historic Magna Carta. The city has a very wide variety of restaurants, cafes, bars and traditional English pubs – there is something for everyone here and Trip Advisor makes searching the dining options very easy! Shopping is a delight – there are all the major chain stores you would expect in a modern UK city but also a wonderful selection of individual stores selling fashion, arts and crafts, galleries, jewellery etc as well as delightful rarities like a stamp dealer and home-brew specialist.